Did you know that Pacific Islanders who eat coconuts everyday have low incidence of heart disease and are seldom overweight. Buy A Coconut For Cooking, Eating or Drinking! Just Crack It Open And Eat! Unpeeled Coconuts weight 4-5 pounds and peeled coconuts weigh 1-2 pounds each. They are picked fresh each day and are shipped via UPS directly from Palm Beach Florida. 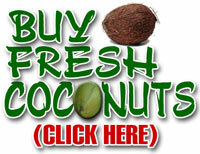 Buy a coconut from our coconut store as a gift, decoration or for cooking. There's nothing like a fresh coconut. Enjoy! Most coconuts reach market with the outer fibrous husk removed, a practice that shortens their shelf life but makes them easier to open. Start the selection process by lifting and shaking the coconut to make sure it is heavy with plenty of water inside. Carefully inspect the outer shell and the eyes to make sure there are no cracks or punctures. A damaged coconut will rot quickly once air reaches the inside of the nut. Examine the three eyes to be sure there is no mold forming there. If the coconut seems too light and you cannot hear water inside when you shake it, the nut may have a thin crack, has lost a great deal of its water, and may have begun to mold. The ideal coconut has plenty of liquid. You can feel its weight and hear it swoosh when you give the coconut a good shake. A fully mature coconut will be dark brown in color. Those with a lighter brown have not yet reached their full ripeness but will still taste quite good. Coconut milk pressed from the lighter colored coconuts will not be as thick and creamy as the darker coconuts, but can lend itself to tasty soups and curries. A mature coconut, unopened, can be stored at room temperature for about three or four months. Once opened, fresh coconut can be stored in the refrigerator in a plastic bag for only a few days. Freeze the coconut for longer storage. A medium-sized coconut will contain about 1 cup of coconut juice. When grated, the coconut will yield about 3 to 4 cups of nutmeat . Young coconuts are sold still in the husk. You can recognize a young coconut by its pale, almost ivory color and by its conical shape at the top. Look for these in the refrigerated section or produce section of some health food and Asian markets. If you're surprised at how heavy they are, try pouring the coconut juice into a measuring cup--just make sure it's a large measuring cup. Young coconuts are valued for their juice, but the coconut meat inside, which is often sweeter than that of the mature coconut, is completely edible and has a softer, more delicate consistency than a mature coconut. The very young coconut meat is almost jelly-like and can be eaten with a spoon. Store young coconuts in the refrigerator. DRIED COCONUT: Coconut comes in dried forms as well as fresh. Most chain supermarkets have the sweetened variety only. Look for the unsweetened grated or shredded coconut meat in a health food market or Asian market. Both forms may also be found in the freezer in Asian groceries. Dried coconut can keep at room temperature for several months if sealed in plastic bags. COCONUT MILK: Canned coconut milk is available in most grocery stores; however, Asian markets offer several brands from which to choose. Notice that the total fat content can vary considerably from 2 grams to 17 grams. The cans with 2 grams of fat will be quite watery and taste diluted. For good flavor, choose a coconut milk with 8 to 9 grams of fat for its excellent consistency and richness in taste. 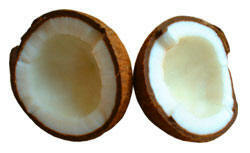 Those with the highest fat are actually coconut cream from the first pressing that offers a thicker and creamier liquid. Once opened, canned coconut milk must be stored in the refrigerator and will keep only a few days. COCONUT OIL: Purchase only extra virgin coconut oil available in health food markets. Though it may be more expensive than the refined oil, its health benefits far outweigh the extra expense. The refined coconut oil is hydrogenated during processing, while the extra virgin coconut oil contains no trans-fatty acids. SUPRISE YOU FRIENDS: MAKE A COOKYCOCONUTS BEER MUG!!! We Purchase Coconuts Every 2-3 Days! "Buy a coconut for good health"